At the April 1, Assessment Appreciation Lunch, Dr. Mysoon Rizk, Associate Professor of Art History, received the Academic Program Award for excellence in assessment. This is the second year running that professor Rizk has been recognized for this achievement. The Art History program was nominated this year due to the strong assessment measures its faculty employ to determine how and what students are learning, and the clarity with which they link those measures to the results and subsequent actions they take in response to the results received. To do this, the Art History faculty designate particular assignments, which are then evaluated against a common rubric. The results are totaled, and shared with all faculty, who meet together to determine if any results are lower than expected, and what should be done to address any such result. 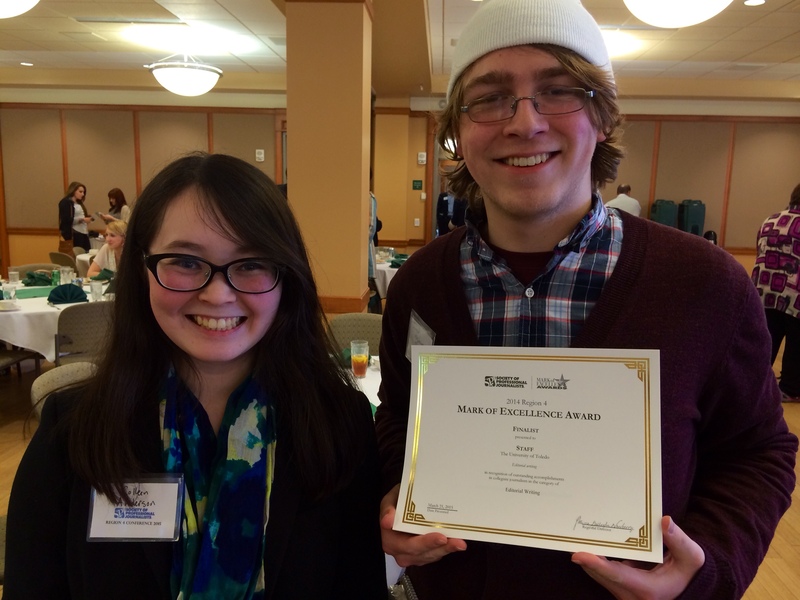 The Independent Collegian was named the best all-around non-daily newspaper in Region 4 at the Society of Professional Journalists (SPJ) convention in Athens, Ohio. 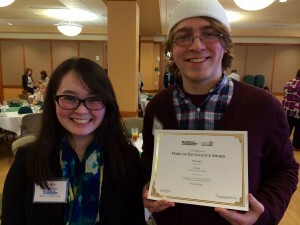 Blake Bacho received first place honors in sports writing, and the staff was a finalist in editorial writing. 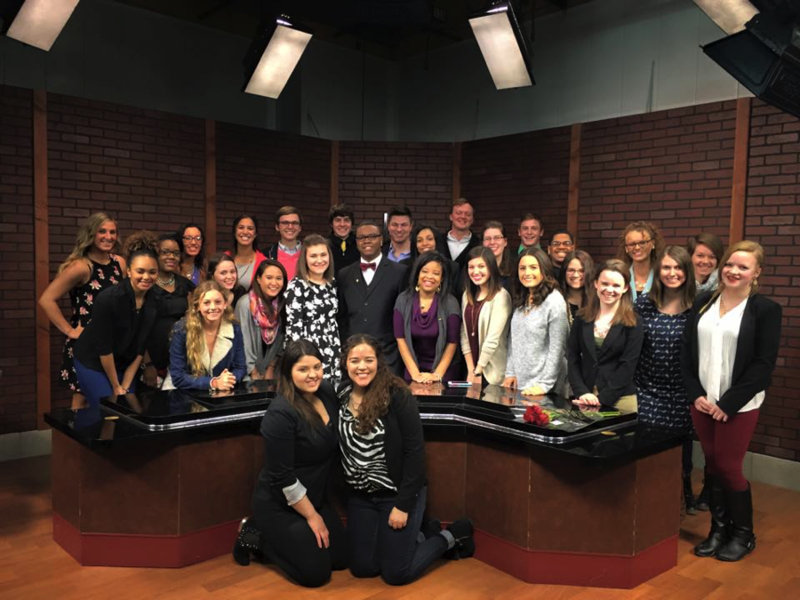 UT:10 News was named a finalist for best all-around television newscast. The student journalists from UT compete with their peers from Ohio State, Bowling Green, Michigan Central, Marshall, and other universities in Ohio, Michigan, West Virginia and western Pennsylvania. Brian Patrick, a professor in the Department of Communication, is one of the most colorful researchers and writers in our college. His recent books have covered issues ranging from the NRA to zombies. 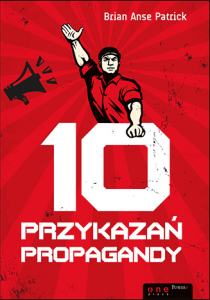 His classic book The Ten Commandments of Propaganda has now been translated for the first time, into Polish. 10 Przykazań Propagandy can be purchased online at the One Press website. Zeta Phi Eta, the national professional fraternity for communication, the arts, and sciences was recently nominated for the Parks Thompson Best New Student Organization Award at The University of Toledo. This award honors Toledo’s most successful student organization formed within the last year. The Beta Theta Chapter of Zeta Phi Eta was founded in January of 2014, having only 10 members. Zeta Phi Eta currently has 37 active members. Throughout the year, Zeta Phi Eta has participated in many philanthropic events on campus such as Relay for Life, The Big Event, Wrap up Toledo, and Tie One On. The recipient of this award will be announced in April. 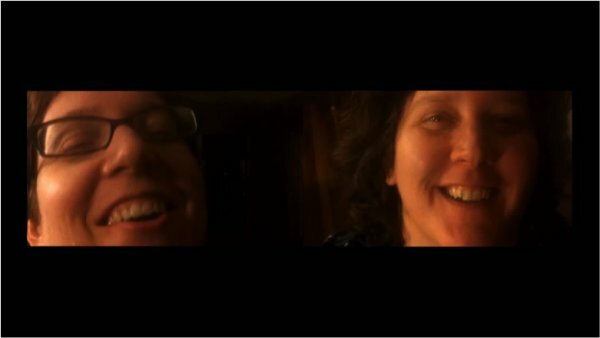 Congratulations to Associate Professor Holly Hey, who screened her film The Dum Dum Capitol of the World at the Ann Arbor Film Festival, the Athens Film Festival, and the Queens World Film Festival. A brief synopsis: The Dum Dum Capitol of the World (Holly Hey, 2014) 21 minutes. An experimental documentary that contemplates landscape, home, memory, queerness, and time. The project illuminates social constructs about sexuality, self, and human instinct. Visible and latent hostilities directed towards queerness surface. The University of Toledo Department of Art will be among the stars this spring, beginning Tuesday, April 14 in Ritter Planetarium. As part of the Planetarium program “Stars: Powerhouses of the Universe,” photographs made by students will be on display in the lobby gallery and on the dome as well. 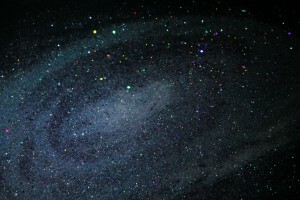 The exhibition, titled “Faux Space,” is the third such photo show at the planetarium. The image on display were made in the Department of Art’s Fall 2014 introductory photo course, ART 2030: Photography, taught by Professor Deborah Orloff. Students were challenged to create photos that evoke a sense of space – in the extraterrestrial sense. They used a diverse range of materials to create their images including food, toys, pots, glitter, fire, lasers, smoke, and oils. 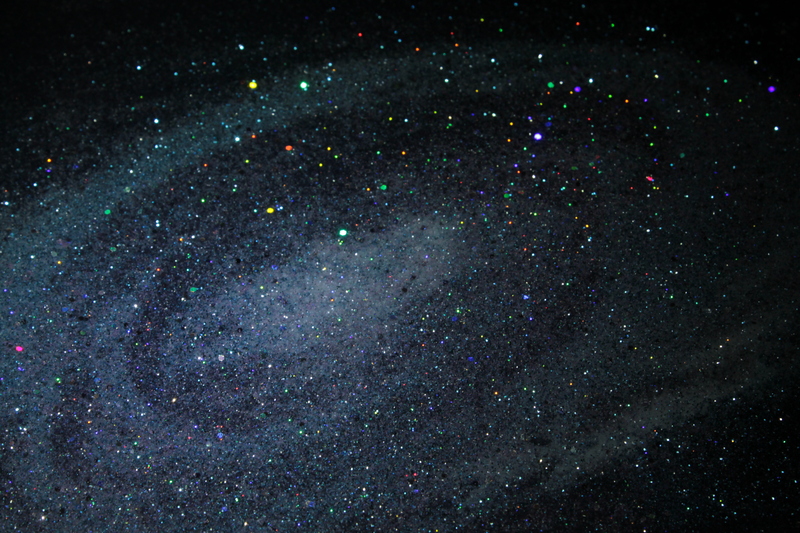 All images were made with a DSLR camera; they are not computer-generated or taken from space. The gallery images will be on display throughout the summer whenever Ritter Planetarium is open to the public. Shalissa Bailey, Jamie Campbell, Andrea Fackelman, Emily Frank, June Galvin and Danielle Hedger; Qiong Jia, Leanne Jones, Chariti Lockhard, Nicelle McCuchen, Kathlynn Meyer and Kayla Perez; Alexandra Ray, Daniel Rivera, Madison Roy, Jamie Snyder, Drew Tansel, Chelsea Thompson, Xueling Zhao and Yue Zhao.